"Suddenly the door opened and in came a man with a roll of newspaper under his arm. He wore a black hat and corduroy suit. He had curly black hair and brown eyes and was very good looking. 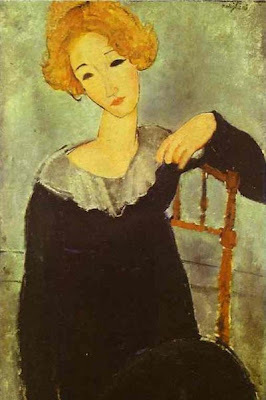 He came straight up to me and said, pointing to his chest, ‘Je suis Modigliani, Juif, Jew,’ unrolled his newspaper, and produced some drawings. He said, ‘Cinq francs.' They were very curious and interesting, long heads and pupil-less eyes. I thought them very beautiful. ...I gave him five francs and chose one of a head in pencil. He sat down and we tried to understand each other and I said that I knew Epstein and we got on very well, although I could not understand much of what he said. He used to drink a great deal of wine and absinthe when he could afford it. Picasso and the really good artists thought him very talented and bought his works but the majority of people in the Quarter thought of him only as a perfect nuisance and told me that I was wasting my money..."
The last sentence shows how wrong some people can be - those drawings are now worth 100,000 times the price that Nina paid... The book, as Robert Scholes says in his splendid 'Paradoxy of Modernism', offers us 'glimpses of the bohemian core of Modernism and ...perspectives on the roles open to women in that dark center of Modernist art.' He also looks at the lives of the spirited Kiki (of Montparnasse) and the elusive Beatrice Hastings who wrote under at least 16 pseudonyms. Thanks PM. Nina and Augustus John both came from Pembrokeshire which may have been a bond. When he met up with her on one occasion he declared with some degree of pride, “We are the sort of people our fathers warned us against!”. I have heard that phrase but never attributed it to AJ. Nina Hamnett relieved Anthony powell of his virginity and was a partial model for Gypsy Jones in A Dance to the Music of Time. An extraordinary book on Peter Warlock is Capriol for Mother by his putative son Nigel Heseltine, who claims- among other things- that Warlock's wife was not in fact his mother and that the Dutch composer Bernard van Dieren poisoned Warlock because Warlocj had made a jocular will leaving all his possessions to van Dieren. So good to hear positive comments (over several posts) about Google Books from the trade. I work in books and ebook publishing, and on the web, and am frequently getting into fights about the future. P.S. If you ever care to write about Jocelyn Brooke, I'll double my subscription. Or something.